Millennials represent the greatest opportunity for insurance and financial advisors, ever. A large portion of a generation that encompasses over 90 million people, and spent nearly $1 trillion dollars last year, are potential clients who do not have a financial advisor. With such an underserved market moving into their prime earning (and spending) years, it’s time to ask the question—what are you doing to earn their business if anything at all? If you want to reach this group it is more important than ever that you are able to speak to them using the methods they already use to connect, and that you are able to be relevant concerning the issues that are important to them. An effective marketing strategy aimed at earning Millennials’ trust must include a solid online ecosystem, which begins with a responsive, mobile-friendly website, effective use of social media and highly targeted email content. But before we get too deep into the tactics, let’s learn a little about what makes this generation tick. Also known as Generation Y (Gen Y, Gen Y-ers) they were born between 1980 and 2000, with the exact years varying based on who is doing the research. They are the largest generation in American history, roughly 92 million strong. Yes, that’s even bigger than the baby boomers, who come in at around 77 million according to research compiled by Goldman Sachs. Millennials are the most educated generation ever. A huge percentage of them have bachelor’s degrees or higher. Tragically, those diplomas come with nearly $30,000 in student loans, also the most in history. Millennials will soon be the richest generation ever. They’re expected to pass baby boomers in total wealth, earning $3.4 trillion by 2018, according to research by The World Economic Forum. They are quickly becoming leaders in business and communities, likely due to the entrepreneurial attitude that is so pervasive among twenty- and thirty-somethings. In fact, 66 percent have a goal to start a business, according to a study by Bentley University. In contrast, only 13 percent hope to climb the corporate ladder. This is partly by necessity. The Great Recession occurred either during or just at the start of their careers. This made it necessary to be more self-reliant, as the hopes of a corporate job right out of college just didn’t exist. They also know what happened to their parents and relatives during the financial crisis in 2008. However, it would be incomplete to ignore the effects of the generation’s economic influencers. For example, entrepreneurs like Mark Zuckerberg (Facebook) are the Steve Jobs’s of this era. Instead of hardware, which was the mark made by 20th-century business moguls, Gen Y is the software generation. And instead of building billion-dollar businesses in their garage, now they start in dorm rooms. For better or for worse, this is a generation of big dreamers. With 85 percent owning smartphones and nearly as many having social media profiles, they are better connected than any other generation. In fact, on average, they touch their phones 45 times a day, mostly to check text messages or social media notifications according to research by Nielsen. Speaking of that connectivity, 95% of millennials rank their friends as the most credible source of product or service information, highlighting the importance of social media—their most used source of connecting with those friends. According to the previously cited study by SocialChorus, more than half of millennials will use social media as a part of their decision-making process for big financial decisions. For example, most people in this age group are likely to ask friends or read blog posts before deciding to buy life insurance. This makes them highly valuable, not only as potential clients but as potential evangelists for your brand, since they are highly connected via social media. ##Marketing to Millennials## So how does one begin? Well, let’s get two things down first. Pay attention, because this is important. If they don’t trust you, they will never do business with you. Period. Full stop. If you don’t convey a sense of trust and competence online, they will never trust you. Period. Full stop. Since millennials’ lives have been so affected by the financial crisis of 2008, there is a heightened level of suspicion regarding those in the financial services sector. While this may be unfair, the unfortunate truth is that the perception exists, so you’ll have to overcome it right away. To inspire trust online, you must do 4 things well. Do you have a solid web presence? 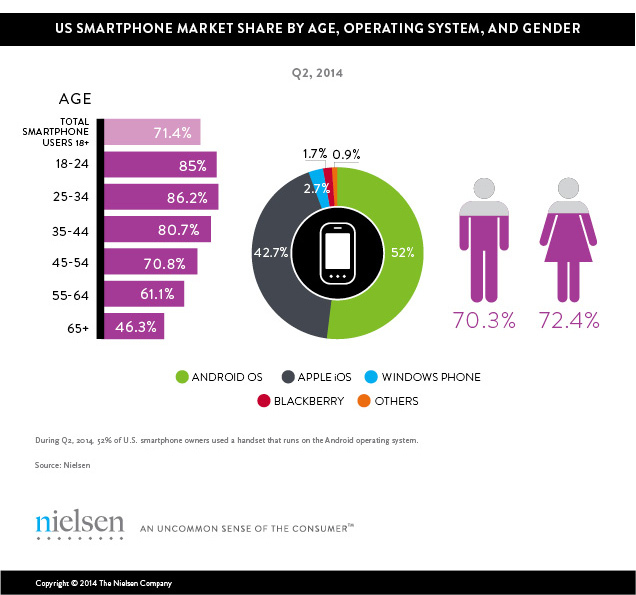 Is your platform mobile-ready? Are you on social media (Facebook, LinkedIn, Twitter)? You need to be found online. If what they find about you online doesn’t inspire trust, don’t expect their business. If they can’t find you at all, it makes that first step particularly difficult. It bears repeating that the most important marketing trends for 2016 and beyond are social and mobile. In fact, Americans spend 55% of their digital media time on smartphones and tablets. Among millennials, this is even more drastic, with 1-in-5 exclusively using a mobile phone to access the internet. You read that correctly. 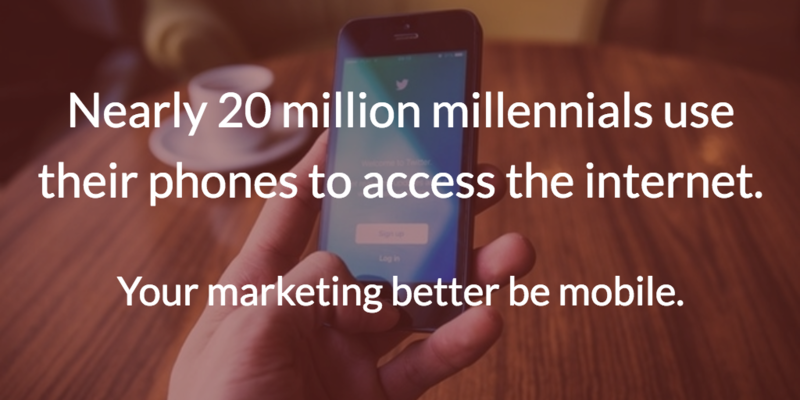 Nearly 20 million millennials use their phones to access the internet. You’d better make sure your website and other content are mobile-friendly. The information age is the millennial age. They created it (unless you ask Al Gore) and they thrive on it. They are literally wired to seek out information, and the technology in their pocket makes sure that no answers are out of reach. So, take advantage of this. Engage in conversation via Twitter, Facebook, and LinkedIn. Respond to and ask questions. Create content regularly via a company or personal blog. The simplest way to start blogging is to use LinkedIn Pulse. Just look for the “Publish a Post” icon on the homepage. If this isn’t an option, Medium is a no frills blogging platform that takes minimal technical skill. If you’re ready to graduate to a more advanced option with more ability to customize and capture leads, move up to a self-hosted Wordpress website. When it comes to the content, don’t be stingy about what and how much information you share. Aim to give as much value as possible with every post. Hold nothing back. Do this and you’ll be rewarded with trust. Pro tip—a great way to cultivate a thriving online community is to start a debate. A successful blogger once told me that the best way to get attention online is to start a fire. >The best way to get attention online is to start a fire. The most tired, fallacious, and ill-earned criticism of millennials is that they are lazy and entitled. The media, especially financial news stations, perpetuate this myth. Marketing to millennials is about showing that you understand their worth and that you know that they have the ability to make sound judgments and great business decisions. Remember, they have the potential to become richer than anyone else before them. That fact alone deserves respect. Direct mail, billboards, phone books, fliers and cold calls just do not resonate anymore. Go show a phone book to a millennial. They’ll probably look at it as if it were a relic in a museum. Call them up on a random Tuesday morning. Your call is going straight to voicemail. They have quite simply, and most-assuredly, turned their brains off to these methods. They don’t work. Don’t fight it. To reach a generation of over 90 million people, who are expected to control over $3.4 trillion in wealth before the end of the decade, create an online brand that is uniquely your own. Use the tools that the information age has made so readily available, like social media, blogs, and email. Convey trust via the quality content you give away for free. If you do these things effectively, you’ll reap the rewards of creating a referral engine full of tech-savvy, well-connected, brand evangelists who can use the same tools to spread your message even further. For more info on how we help our advisors reach the top of their field, contact us today. This post originally appeared in Broker World Magazine.